The PENTAX K-1 features an operation system full of innovative inspirations and new ideas. The most symbolic feature is the pair of dials positioned on the upper panel: a Smart Function dial, and a setting dial. However, the PENTAX K-1 product development team had to overcome much difficulty in designing these dials. In the beginning, it was a product planner of the PENTAX K-1 who insisted on adding a new dial. PENTAX’s Hyper Program mode is an innovative operation system that frees the photographer from troublesome AE mode switching. However, the system has one hurdle in the exposure-compensation operation: it requires the user to depress a button while also turning a dial. To solve this problem, the designer proposed a three-dial setup for the PENTAX K-1. Although this might seem a very logical proposal, it wasn’t easy to perfect the setup. The Hyper Program mode was originally developed from a concept of “delay-free reaction.” It works best when the scene or application leaves no time for exposure compensation. If there is time for exposure compensation, the Hyper Manual mode is the more reasonable choice. The operation completed by a combination of the Programmed AE mode and exposure compensation in the Hyper Program mode can be accomplished by a combination of the Green Button and front/rear e-dials in the Hyper Manual mode. Since the latter combination allows for exposure compensation by shifting either the aperture or shutter speed, it is a more logical way to attain the photographer’s goal. Consequently, there was no need to add another dial to the Hyper Operation system. The user-interface designer added, though, that, “The rest of the development was nothing but trouble.” His team had to determine which functions would be assigned to the new dial. A group of user-interface designers were assigned solely to work on this task. In addition to scrutinizing proposals submitted by their colleagues, they also collected opinions from a number of professional photographers. While narrowing down the possible functions through repeated discussions, they also had to reconstruct the user interface and design new firmware to eliminate any discrepancies with conventional operation systems. It was just before the preparations for mass production were under way that they could finally decide on the final set of functions. With the addition of the new dial, the PENTAX K-1’s graphical user interface (GUI) was then designed anew by developing design elements used in the PENTAX K-S1 and K-S2, while also using the PENTAX 645Z’s GUI as a base. The design elements incorporated in the PENTAX K-1 included an easy-to-see, simplified structure; scalable fonts with smooth outlines regardless of the size of the display; and use of animations. The designer suggests that the best way for users to understand this new GUI is to actually hold the PENTAX K-1 and operate it themselves. Turn the exposure mode dial, and a guide screen slides into the LCD monitor from the top and the bottom. Turn the front or rear e-dial, and a dial displayed on the GUI rotates in the same direction. Press the focus point shift button, and a corresponding focus point in the focus point diagram is highlighted on the LCD monitor. 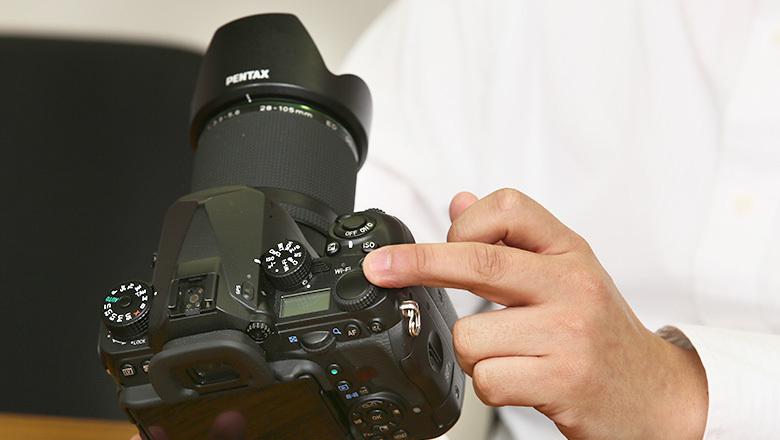 In fact, every time the user makes a key operation, the PENTAX K-1 responds to it with an animation. “Even a minor design element could make a considerable difference in the ease of operation — whether we included it or not,” the designer says. “If we put too much emphasis on any one element, it might become annoying. If we didn’t do anything with it, it might not work well.” The GUI designer worked extremely hard to find the ideal balance of all these design elements. The same was true with the design of the menu screen. The background isn’t a solid, single color, but is made of a sand-like texture with fine gradation. Since it has an extremely subtle appearance, you might not even notice unless it is pointed out to you. However, this background has a minor but important effect on the PENTAX K-1’s operation system, making it more user-friendly and easier to use than conventional systems. A GUI like this one cannot be created from thinking based solely on the camera functions. The PENTAX K-1’s design team was meticulous about every detail down to the menu icons. Out of all of the new features in the PENTAX K-1, perhaps the outdoor-oriented LCD monitor is most symbolic of this. Including a star, moon, and large and small suns, the icons were designed to help the user visualize a particular situation, rather than just provide a simple indication of the brightness level. 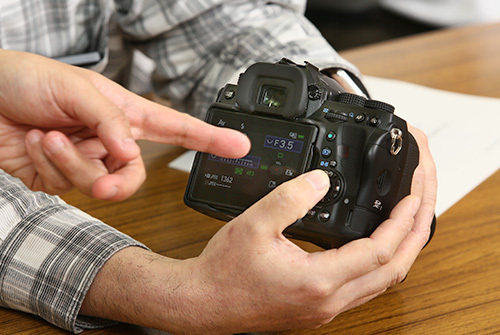 Since the PENTAX K-1’s control panel can be customized to the user’s preference, the team had to design new icons for functions that weren’t displayed on the monitors of previous models. In the end, the team drew almost two thousand sketches for the new icons. This is just one of the examples of the team’s devotion to optimizing the user’s operational comfort. A repeatedly asked question: what is the true meaning of every visible design element? The LCD monitor is a digital SLR camera’s vital user-interface device. There are many different monitor types used today, including tilt and vari-angle versions. The product planner, however, had neither in mind; he requested a monitor that could be shifted to any desired angle both horizontally and vertically without affecting the correct alignment of an optical axis. A mechanical designer assigned to monitor design initially thought that this was a very demanding request. Knowing the product planner’s goals, however, the designer decided to look into all possibilities — even though he knew this would be a very difficult task. After making sketches of all feasible possibilities, he realized that every one of them had a downside — for instance, a design that wouldn’t return to the original position once opened, or a design that would protrude too far out from the camera body. After a long selection process, the final remaining idea was based on a folding table. This did mean some restrictions on the angles to which it could be adjusted, but it was a simple, realistic design in terms of structure. Although it appeared feasible as a sketch, the designer wasn’t sure if this design was in fact a practical choice. So he decided to produce a sample model by himself. “Colleagues who looked at my desk must have thought that I wasn’t working on a camera after all, because none of the parts there belonged in the camera business,” he says. After the designer assembled the parts, however, he realized that the monitor could be tilted both horizontally and vertically, but also diagonally. He also successfully reduced the thickness to a practical level. The next problem was how to refine it to become part of the final product. Because all the parts moved three-dimensionally, there was the possibility of issues emerging that wouldn’t be revealed by the computer CAD image. There were no standards of strength and durability for this kind of structure. 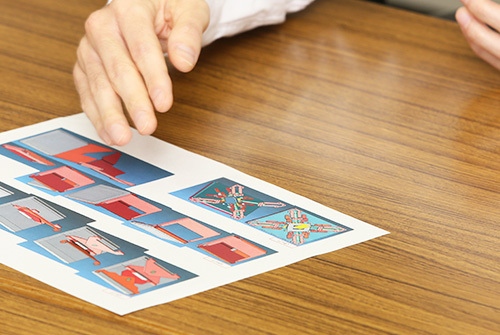 The only way to refine the design was to keep on making sample models until he was fully satisfied with the test results. What troubled him most was the balance between a smooth opening/closing action and durability. When he added a slight twisting action so that the structure could withstand a certain weight, the rail on which the monitor moved was wrenched off. When he then tried to overcome the problem by making the part thicker, the monitor would stick and wouldn’t open smoothly. So he shaved the part bit by bit until he found the ideal thickness. At the same time, he also had to pay careful attention to the wiring. Ideally speaking, when the monitor was returned to its original position, all the cables should store away into the designated locations without friction. The engineer came up with the final shape and size of each part by closely examining the movements as the monitor shifted its position. The appearance of the flexible tilt-type LCD monitor may seem a little too extravagant, because it is protected with a thick rubber housing. 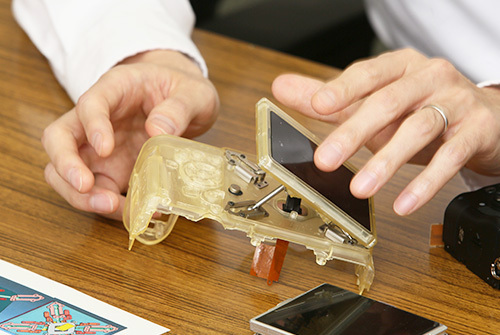 The housing, however, was designed to eliminate friction between the moving monitor and the camera body, and prevent them from damaging each other. In terms of structural strength, this monitor is as dependable as tilt and vari-angle versions. 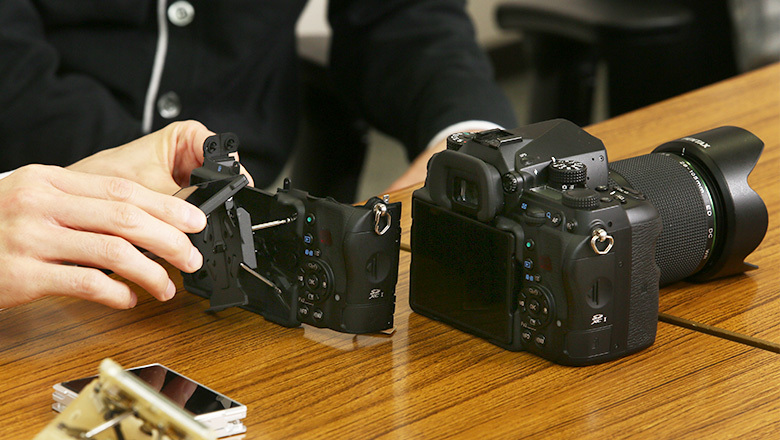 The PENTAX K-1 also features such user-friendly devices as Operation Assist Light. The development team provided the PENTAX K-1 with the highest possible specifications, with features to satisfy the many tough demands of the Pentax users. The team even reassembled the classification categories and order of functions appearing on the menu screen by taking actual photographic styles into consideration. The PENTAX K-1 is a 35mm full-frame digital SLR camera that is easier and more flexible to use. It embodies the message of its designers: every single visible element of the camera has been designed to provide a closer, friendlier relation between the camera and the photographer.